Served on two separate trays, this is a beautiful complement to any buffet table. A choice of cold cuts straight from our kitchen. Including rye, pumpernickel, or Challah rolls. Our delicious cold cuts sliced fresh in the Deli served with your choice of cheese. Do you ever crave our classic comfort food at your party or event? Let Downbeach Deli's expert staff cater your next party, business luncheon, religious gathering, event or celebration. Our delicious cold cuts sliced fresh in the Deli served with your choice of cheese; Russian dressing, mayonnaise, mustard, potato salad, and coleslaw; garnished with pickles, peppers and pickled tomatoes. Your choice of breads and /or rolls. Priced per person and Kosher option available upon request. We have a delicious variety of fresh baked goods.Choices include fresh baked cookies, schneken, brownies, and hamantaschen. A choice of cold cuts straight from our kitchen. Choose from rye, pumpernickel, or Challah rolls. Our price includes a separate tray of potato salad, cole slaw, mustard, mayonnaise, and Russian dressing; garnished with pickles, peppers, and pickled tomatoes. Cream cheese, butter, fruit preserves, tomatoes, cucumbers, and cheese slices displayed decoratively on a tray and served with assorted bagels; great for office breakfast meetings! (coffee service available). Ideal for all occasions. 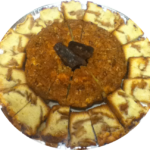 A round apple or cinnamon-walnut cake (sliced whole); surrounded by slices of our homemade Jewish apple cake. An assortment of fresh fruits and a variety of cubed cheeses to compliment your meal. Fresh grilled vegetables including eggplant, zucchini, onions, sweet potatoes, peppers, and mushrooms; charbroiled with olive oil and garlic. A whole tenderloin spiced and seared, cooked rare, cooled, sliced and garnished with our special horseradish sauce, deli mustard, pumpernickel and rye. Meals include choice of chicken noodle soup with matzo balls or salad; rotisserie grilled chicken, brisket or turkey; choice of mashed potato, baked potato, baked sweet potato, rice or kasha and bowties, and the green vegetable of the day. Dessert choices includes baked apples, or rice pudding. Jewish Apple cake is available with orders for 10 or more people. Served on two separate trays, this is a beautiful complement to any buffet table. The first tray has a jumbo whitefish stuffed with whitefish salad, slices of kippered salmon, fresh hand sliced nova or lox, and chopped herring. The second includes your choice of two hard cheeses, cream cheese, tomatoes, onions, cucumbers and olives. This platter provides 1 1/2 bagels per person. Freshly poached salmon decorated and chilled, garnished with cold cucumbers, dill and sour cream sauce (Fat-free choice available); the perfect low-cal and low carb entree for your next party. 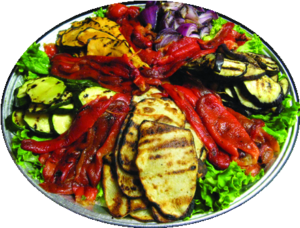 We offer a variety of salads and vegetables to compliment the meal. Whole wheat wraps with your choice of these deli fillings: cold cuts, tuna, egg, shrimp or chicken salads. Add 95 cents per person for an added tray of potato salad, cole slaw, mustard, mayonnaise and pickles. Priced per person. Your choice of tuna, chicken, or egg salad, turkey, roast beef, ham and Swiss, or vegetarian subs. Our price includes a separate tray of potato salad, coleslaw, mustard, mayonnaise, and Russian dressing; garnished with pickles, peppers, and pickled tomatoes. Kosher option available upon request. 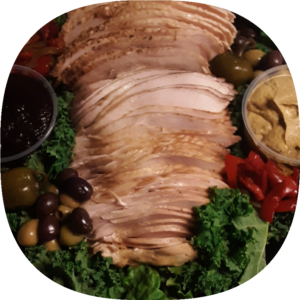 Our fresh rotisserie grilled turkey breast; deboned and served sliced with cranberry sauce, mustard, sweet peppers, pumpernickel and rye. Let Downbeach cater your next party, business luncheon, religious gathering, event or celebration. We can handle any size group. Order one of our convenient full trays of subs, smoked fish, cold cuts or plan something different altogether. We specialize in Bar Mitzvahs and Bat Mitzvahs and also offer Shiva Meals. Please contact one of our team members at (609) 823-7310 or downbeachdeli@gmail.com to get a specific quote based on your party needs. Give us a call for a free quote to cater your next big event! We specialize in smoked fish trays, deli trays and NY style Jewish cuisine. Come enjoy our $12.95 dinner specials all night long from 3:30 pm Until closing Sunday through Thursday and from 3:30 pm until 6 pm Friday and Saturday. © Downbeach Deli 1982-2019. All Rights Reserved.